Manila—(PHStocks)—Philippine stocks rallied for the third session amid market optimism in Asia as well as sustained investor confidence in the United States after the Fed’s announcement of continued stimulus program. The mainboard Philippine Stock Exchange (PSE) index added 2.17% or 137.28 points to close at 6,465.28 today, 28 June – ending the last trading day of the first half of the year on a positive note. 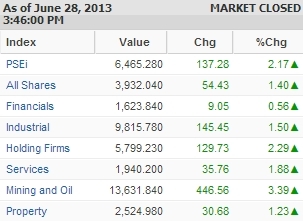 All counters remained in the green, led by the Mining & Oil index, which gained 3.39%. The Holding Firms sector posted a 2.29% gain, while the Services segment went up by 1.88%. Value turnover reached PhP15.3 billion on 7.53 billion shares traded. There were 96 gainers today against 71 decliners, while 47 stocks were flat. Most active stocks today include SM Investments Corporation (SMIC, PSE: SM), Ayala Land Inc. (PSE: ALI), SM Prime Holdings Inc. (PSE: SMPH), Philippine Long Distance Telephone Co. (PLDT, PSE: TEL), BDO Unibank Inc. (PSE: BDO), Metropolitan Bank & Trust Company (Metrobank, PSE: MBT), Universal Robina Corporation (PSE: URC), Ayala Corp. (PSE: AC), Alliance Global Group Inc. (PSE: AGI), Metro Pacific Investments Corporation (MPIC, PSE: MPI).